goes through R2 . The sum of the currents I1 and I2 equals the total current ITOT. 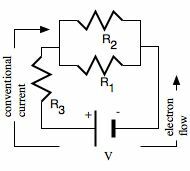 In parallel circuits current is split at least one junction. Unlike the series circuit, adding more branches reduces resistance and increases current. This is easy to understand: Suppose a large city developed on both banks of a river and there was only one bridge across the river. If the bridge was narrow, a traffic jam would probably develop at least during rush hour. One way to reduce the resistance to traffic flow would be to build another bridge. With more bridges across the river, more traffic flows. With more branches in the circuit more current can flow, and the less resistance there is to current flow. The voltage supplied to each branch is the same as the voltage supplied to the source. A branch with low resistance carries more current than a branch with high resistance. ITOT = I1 + I2 + . . . .
VTOT = V1 = V2 = . . . .
1/(REFF) = 1/(R1) + 1/(R2) + . . .
4. In the diagram of a parallel circuit above, suppose R1 and R2 were light bulbs. If the light bulb at R2 burned out, what would happen to the brightness of the light bulb at R1? 5. Two resistors, 2.0 ohm and 3.0 ohm, are connected in parallel with a 12 V battery. Calculate: (a) the effective resistance of the circuit; (b) the current leaving the battery; (c) the current through each resistor; (d) the voltage drop across each resistor. 6. In the following diagram the three resistances each represent identical light bulbs. Describe what happens to the brightness of the other light bulbs when one of them goes out. 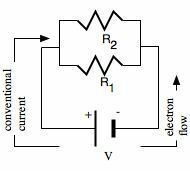 A complex circuit consists of parallel loads in series with at least one other load. 7. Sketch a diagram showing a complete circuit involving only a dry cell, one wire, and a flashlight bulb.